A Pennsylvania company liable for upwards of $10 million in penalties for putting up illegal supergraphic signs at five different sites alongside L.A. freeways has agreed to pay the state of California $218,000 for the dismissal of all claims against it. Under state law, the company faced fines of $10,000 a day and could have been required to disgorge revenue earned while the signs were up between 2007 and 2010. Caltrans, the agency in charge of signage enforcement, also investigated the cutting of trees in the public right-of-way that were partially blocking motorists’ views of the signs at two sites, but no charges have been filed, and the results of the investigation have never been made public. The signs located alongside the 10, 405, and 101 freeways were cited between 2007 and 2009 for violating state law that requires a permit for any sign within 660 of a freeway. The law also limits sign height to 25 ft. and overall size to 1,200 square ft., both of which were violated by the signs that were attached to the walls of office buildings, parking structures, and storage facilities. The company, World Wide Rush, was also cited by the city of L.A. for failing to obtain permits for signs at the five freeway sites, as well as seven other non-freeway adjacent sites in various parts of the city. The company subsequently sued the city to stop enforcement and in 2008 got a favorable ruling in U.S. District Court. That ruling was overturned last summer by the 9th Circuit Court of Appeals, and shortly thereafter the company took down its signs. In February of last year, the L.A. City Attorney’s office filed a civil lawsuit against World Wide Rush and more than 20 other business entities, property owners, sign installers and individuals, seeking millions in damages for illegal installation of supergraphic signs at the 12 locations. That lawsuit seeks damages for, among other things, the violations of state law by the freeway-adjacent signs. 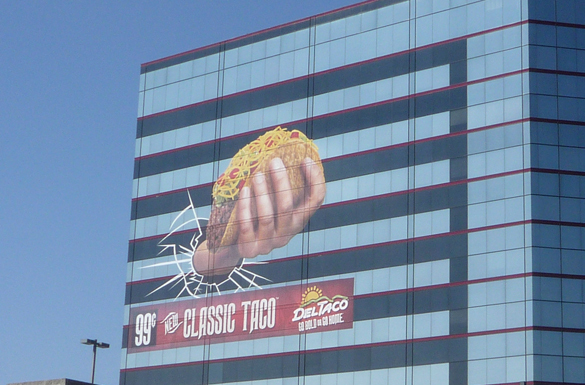 The California Outdoor Advertising act as well as case law empowers local cities to enforce the act, including the penalties and provision for disgorgement of illegally gained revenue. Whether or not the settlement by Caltrans damages the city’s case now in L.A. County Superior Court remains to be seen, although it affects major parts of the city’s claims. Revenue figures for such signs aren’t public record, but a 2009 breach of contract lawsuit by Sony Pictures against World Wide Rush included a copy of an agreement that including a payment of $487,500 for 6 months of supergraphic signs at a 405 freeway-adjacent storage building in West L.A.